Saskatoon’s brightest light is helping NASA capture never-before-seen images from the darkest parts of space. Scientists from NASA’s Goddard Flight Center have called Saskatoon home for the past few weeks. 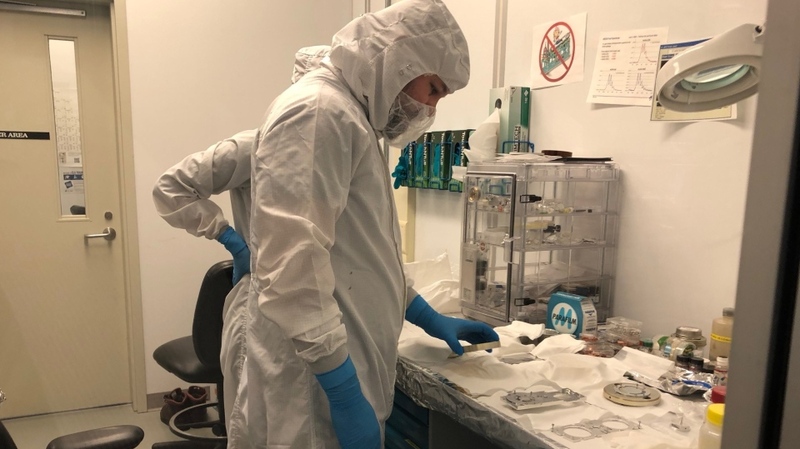 They’re using the synchrotron to calibrate incredibly delicate telescope filters that will eventually be fired into the earth’s orbit where the telescope will capture photos of black holes and gases around them. NASA’s Nick Thomas said the synchrotron’s powerful beam of light is helping them imitate the X-ray beams coming from a black hole. They’re using the beam of light as a stand-in for the X-rays being emitted by the black hole. The NASA team is made up of academics from around the world. The filters determine which photons make it through to the picture and which light is blocked out. The filters are thin pieces of plastic with an even thinner aluminum coating on the surface. Thomas said they’re so delicate if someone touches one with a finger, the finger will go right through it. However, they can withstand the incredible force of vibrations from being launched and the icy temperature of space: -273 degree C.
This telescope, named Xrism, weighs about 2,000 kilograms and stands about two car lengths long. The telescope is expected to be launched into space in a few years by the Japanese space agency and NASA. Thomas said the telescope will orbit the Earth for at least a decade and create incredible artwork. “I know I’ll put it in my living room, actually it’s going to go on my mom’s fridge,” he said.